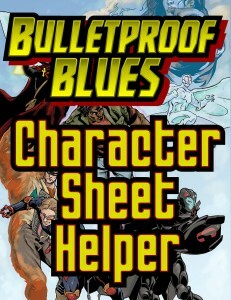 We have finally wrapped up all the changes and improvements we hoped to make to the Character Sheet Helper. Barring the discovery of any new bugs or serious omissions (knock on wood), it’s ready to go! Feel free to use it, and post any questions you might have to the Kalos Comics mailing list. While I have your attention, please take a look at the Kalos Comics pages on Facebook and Google+. More characters will be posted to the Kalos Universe wiki as we write them up. Well, poop. While tinkering with the spreadsheet while on the road, I found a serious bug. The power data for [Attribute] Drain was entirely missing. I have fixed it, and have updated the Character Sheet Helper on DriveThruRPG to version 1.06. This entry was posted in Characters, Heroes, Software, Villains by bblackmoor. Bookmark the permalink.